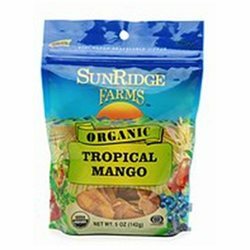 Our SunRidge Farms Dried Fruits:Are USDA Organic, Certified by QAI Use no chemical fertilizers or pesticides in our growing methods Contain no preservatives, artificial colors, flavors, or hydrogenated oilsSunRidge Farms Organic Dried Fruits are carefully chosen from premium orchards and vineyards chosen from premium orchards and vineyards throughout the world. These dried mangoes are not great. 30 grams of sugar per serving and tough as shoe leather.Unfortunately, I have four bags left and may throw them out.My search begins anew for the perfect dried mango like you can buy in Thailand. The best tasting dried mango slices! ... if you are have allergi.. These dried mangoes taste better than all the other dried mango products that I have tried (and reviewed). The pieces are really large. No tiny scraps in these bags!As with all dried fruit, some pieces are a bit drier than others. However, in this product, I am pleasantly surprised to find only the odd piece that is a bit overdone - hard and dry, but tasty nevertheless!SEE MY PHOTOS IN CUSTOMER IMAGES are USDA Oragnic. They are packaged in the US in convenient four serving size re-sealable bags.This pro..
Jeffrey A "Jeff" (FL) -.. I absolutely love these and am a little addicted to them. They have been a little hard to find since I recently moved. 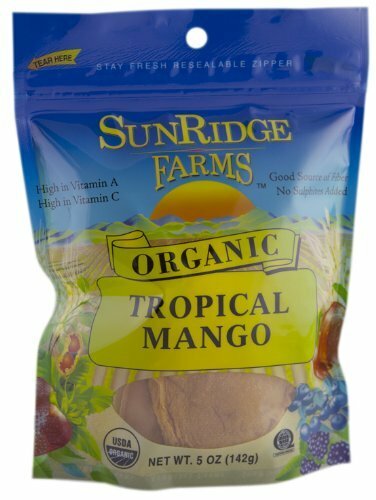 Unfortunately, most companies add sugar which in my opinion ruins them but these are absolutely perfect and tasty!I have gotten a few bags where the mango slices were very hard but I just placed them in front of my space heater for a few minutes and they softened right up. Margaret S. - See all m..